At Encore Broadcast Solutions we know that in order to sustain your audience in today’s world you must effectively appeal to their audiovisual senses. This can mean using a higher lumen projector in your church, a more sophisticated video teleconferencing solution for your meeting room or an eye catching digital sign in the front of your office. The possibilities are endless when you partner with Encore. We will design, integrate and support your AV system for one extraordinary solution. Encore will quickly become your most trusted source for AV Systems Integration. We have the industry knowledge and over 75 years combined experience to recommend and install the greatest equipment from the top manufacturers. The goal is to seamlessly blend these technologies to exceed your expectations within budget. Our exceptional integration team consists of trained design engineers and sales staff, technicians and support professionals that will create a comprehensive plan for your communication needs. You will feel the difference in our service as we treat each customer as one of our team members. We strive to ensure every question is answered, every wish is fulfilled and the customer feels confident throughout the life of the project. Federal government agencies rely on Encore Broadcast Solutions to bring them a cost effective, comprehensive solution to their AV communication needs. We can engineer, install and support a system from an entire Emergency Operation Center, military Command and Control Center to a secure videoconference in their meeting room. State and Local entities use audiovisual technology throughout their daily operation. Encore has the experience to provide your solution for live council meetings, broadcasting of public access information, courtroom proceedings, digital signage and more. K-12 educational facilities have partnered with Encore to encourage learning through audiovisual means. We can help students and teachers succeed through virtual classrooms, live web broadcasts of school events, full broadcast studios for instruction, stadium sound and lighting systems, to name a few. Higher education is a competitive and ever changing industry. As the world evolves the modern student now expects a greater level of technology to complement their learning environment. At Encore we can provide a cutting-edge, turnkey AV system that will wow your audience through “SMART” classrooms, distance learning rooms, auditorium projection and audio systems and video production studios. The students will love to learn! It doesn’t take a miracle to influence your congregation in today’s world. But, it does take moving into the digital age and becoming a leader in your community with the right audio, video and lighting presence. With strategically placed screens backed by state-of-the-art projection systems and reinforced audio, the lead pastor can effectively convey their message. Encore has experience with any size facility to help fully immerse members in music and video while designing the audio video system to blend in with the décor of the facility. We know an important design factor in any church AV system is to not distract from the message, but only to enhance it. 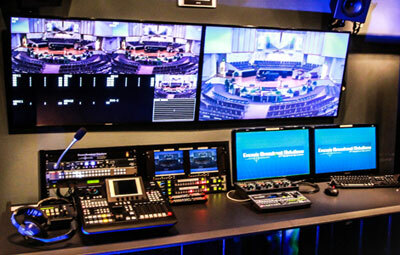 From Fortune 500 to small business Encore Broadcast Solutions can be your premier AV communications provider. As the business world expands the need to reach larger audiences faster is vital. Videoconferencing and streaming digital media over IP for boardroom meetings or training sessions have become a part of daily business operations. We will help reach your employees and customers, connecting everyone effortlessly. At Encore we know that superior technology, smart design and flawless execution are the keys to effectively impress the audience. A powerful stadium or venue is equipped with large-format video displays, audio design and broadcasting control rooms to enhance the high energy environment. The use of videoconferencing in hotel meeting spaces, streaming digital media signage or projecting your mission statement to potential buyers on large screens will not only increase sales, but will generate satisfied, repeat customers through an amazing experience! Whether you have an educational healthcare facility or clinical hospital Encore can assist with your AV needs. We have experience with digital media systems that stream live content, record for training and display content on lobby signage. We integrate videoconferencing technology to enhance educational resources and physician’s abilities to direct live medical procedures remotely. Encore is dedicated to providing a cost effective, custom solution that will fulfill the critical needs of each organization in the healthcare industry.